The Led Sofa category offers many styles of modern and design illuminated sofas for both indoor and outdoor use. 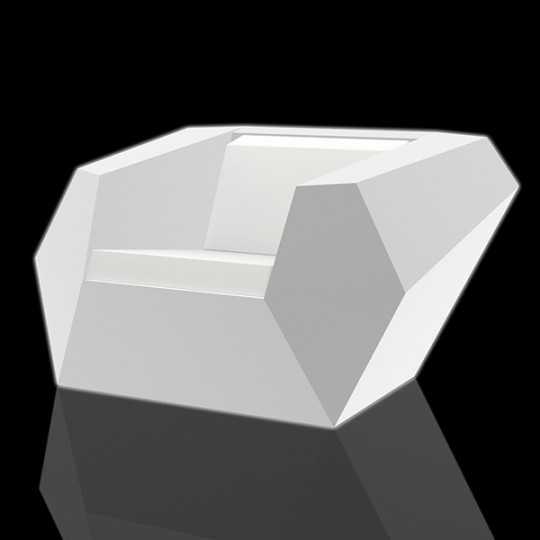 Designed and manufactured in Europe, this furniture is perfectly suitable for professionals such as architects, designers, event organization or hotels & restaurants owners. Discover the bright Rainbow effect of the Blow Sofa RGB by Vondom. 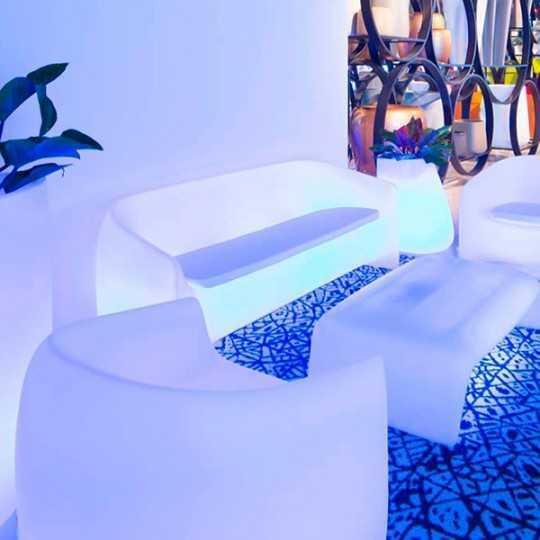 The Solid Translucent Polyethylene structure allows an intensive Outdoor use, perfectly adapted to your Hotel or Restaurant activity.Turn your Poolside, the Garden of your Hotel or your Bar Area into a stunning and and luminous place that will be noticed! 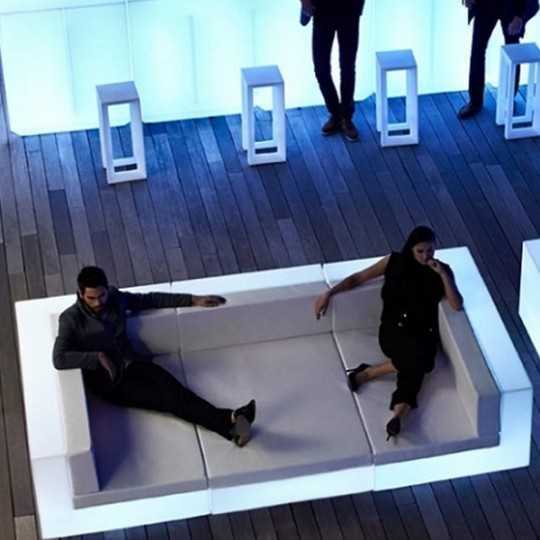 The Blow Sofa by Vondom lights up like a White Leds Lamp. Its Translucent Matt Polyethylene structure is highly resistant and allows intensive outdoor use.Turn your Poolside, the Garden of your Hotel, your Restaurant or your Bar area to a magical place your customers will like to come back to. 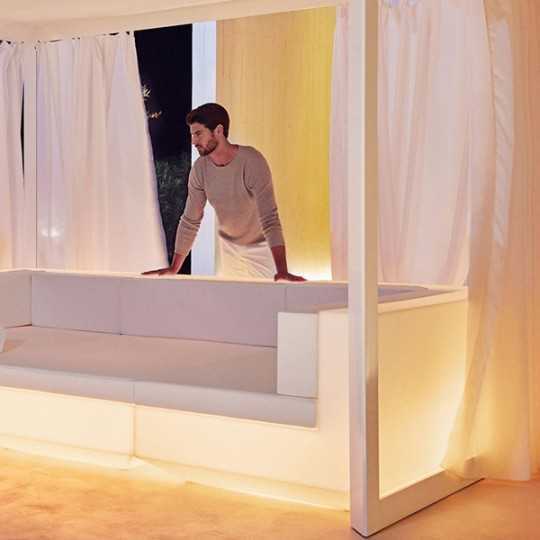 The Outdoor Sofa ULM can be white internally lit with LED technology. This advanced system was created by Vondom and the Spanish Designer Ramon Esteve. You can turn your Night-club, your Bar or your Hotel Terrace into a magical place. Its structure is made of Ice Color Matt Polyethylene that is highly resistant and adapted to a professional intensive use. Vela Sofa RGB Central has a multicolor lighting feature. Vondom is number one in that new type of lighting Equipments for Restaurant, Night Club, Poolside. Combine Vela Sofa Armless with other RGB elements of Vela collection like on main picture. Play with different light colors and your guests will enjoy this magical Place you made. Made in Spain. 1 528,00 € tax excl. 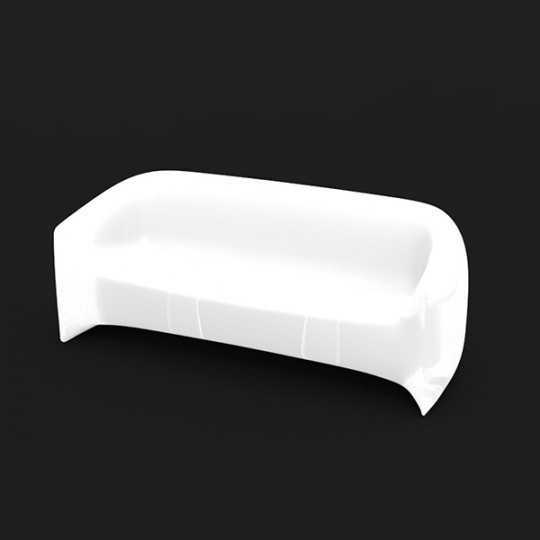 The Vela Sofa is a remarkable removable Chaise Lounge by Vondom. This cozy Deck Chair can be white internally lit with LED technology. 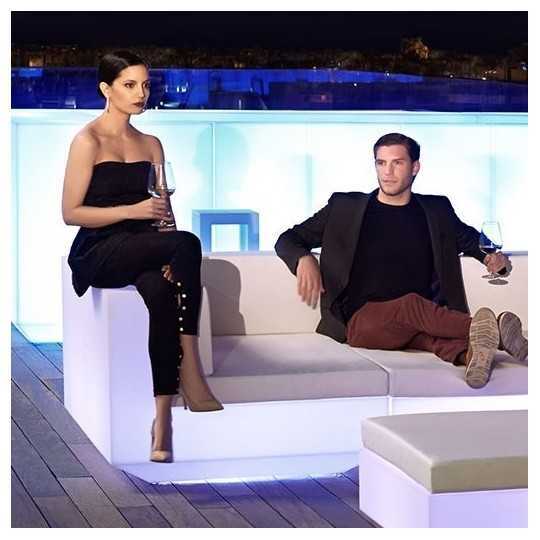 This new kind of Outdoor Couch will perfectly fit in the garden of your Hotel or Nightclub and create dim light. You can also mix different furniture of the Vela collection and create your own unique place as on main picture. Vela Sofa RGB Right has a multicolor lighting feature. Vondom is pioneer in that new type of lighting Equipments for Hotel, Restaurant, Club, Poolside. Combine Vela Sofa sectional right with other RGB elements of Vela collection. Play with different light colors and your guests will enjoy this incredible Place you made. Made in Europe. 1 638,00 € tax excl. 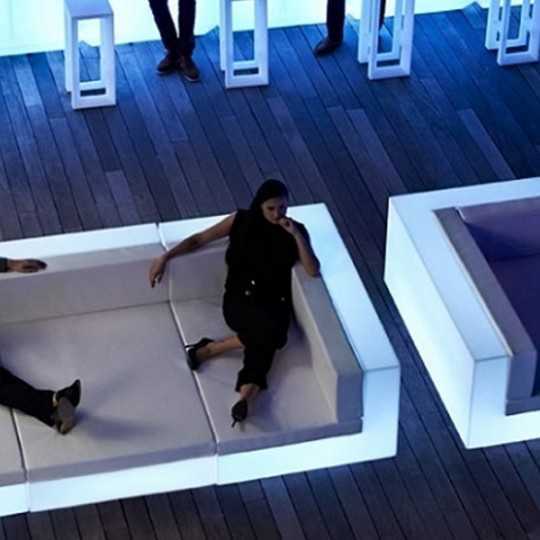 The Vela Sofa sectional right is a surprising modular couch by Vondom. This comfortable Deck Chair can be white internally lit with LED technology. This new kind of Sofa will perfectly fit in the Garden of your Hotel or Nightclub and create dim light. You can also mix different furniture of the Vela collection and create your own unique place. 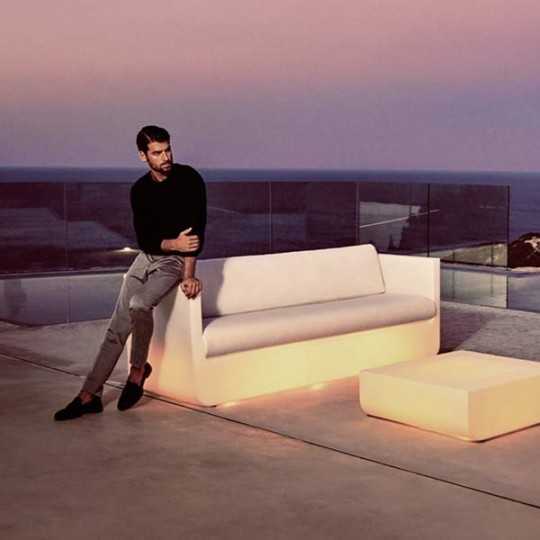 The Vela Sofa left by Vondom is an Outdoor or Indoor modular couch. Besides, this comfortable deck chair can be white internally lit with LED technology. This Vela Sectional Sofa Left offers many combination possibilities. It can be used by itself or it can be combined to other modules of the Vela collection (as shown on the main picture).